If you follow me on just about any of my social medias you will know that I am passionate about shopping local and eating local. Because of that my husband and I have been purchasing our beef, in bulk, from local farmers. This year we decided to purchase from Foggy Dale Farms in Richie Co., and in our quarter beef there were a lot of top round steaks. I will confess that I am not totally familiar with that cut, and was a little perplexed as to what to do with it. 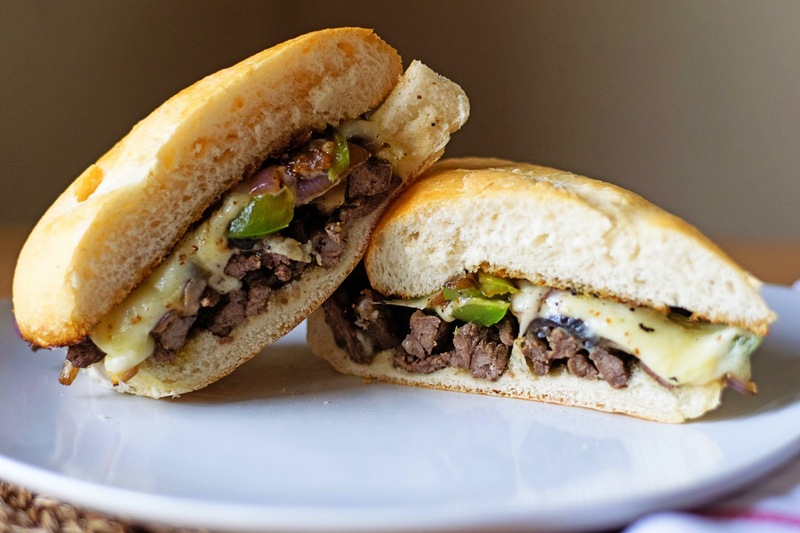 So I went to my good friend Google and discovered that top round is a great cut for Philly Cheese Steak Sandwiches. Instantly I knew this was the perfect dish to make for Studhubs from our new meat haul and it was DELICIOUS! I can't wait to share it with you, so let's get started! To begin you will need to season the top round steak, liberally, on both sides, with the seasonings. Next, cut it into 4 parts to make it more manageable and thinly slice it. Now you will place a skillet over medium/high heat and allow it to get hot. Add 2 tbsp. of butter and 2 tbsp. of oil to the skillet. Now you can add the steak and allow it to cook, about 5 minutes. At about 2 minutes add the Worcestershire sauce. When the steak is finished remove it from the pan and drain the fat from the pan. Add the rest of the butter and oil to the pan. Allow them to cook until they are soft and translucent, about 2 minutes. Next add the green pepper. Cook until tender, another 2 minutes. Finally you can add the mushrooms. It should look like this when it is ready. Now is time to assemble. Place the bottom of the bread on a baking sheet. Place the steak on the bread. Then add the pepper, onions, and mushrooms. Finally top it with the cheese. Feel free to toast the top half of the bun if you like. Beefy, savory, cheesy.....OOOOOOOO so good! I promise that if you put these beauties on the table tonight NO ONE will be complaining! And why wouldn't you? 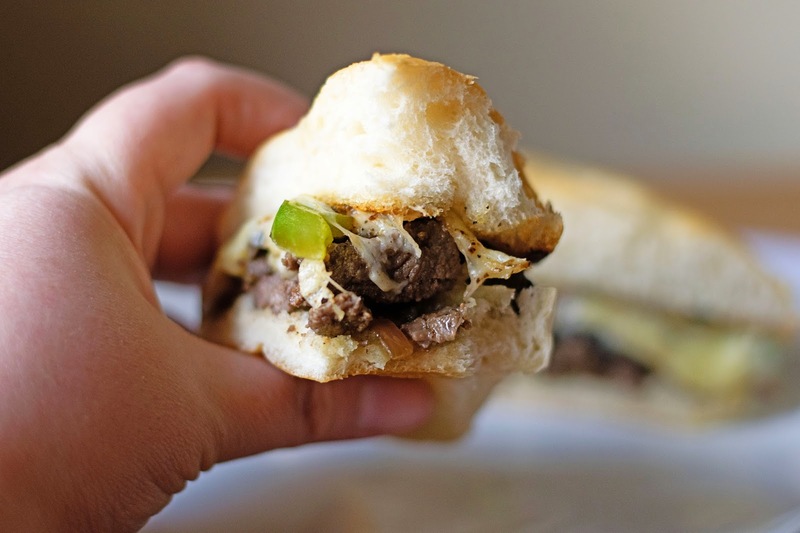 A great, inexpensive meal in 20 minutes! It's a win/win for everyone. 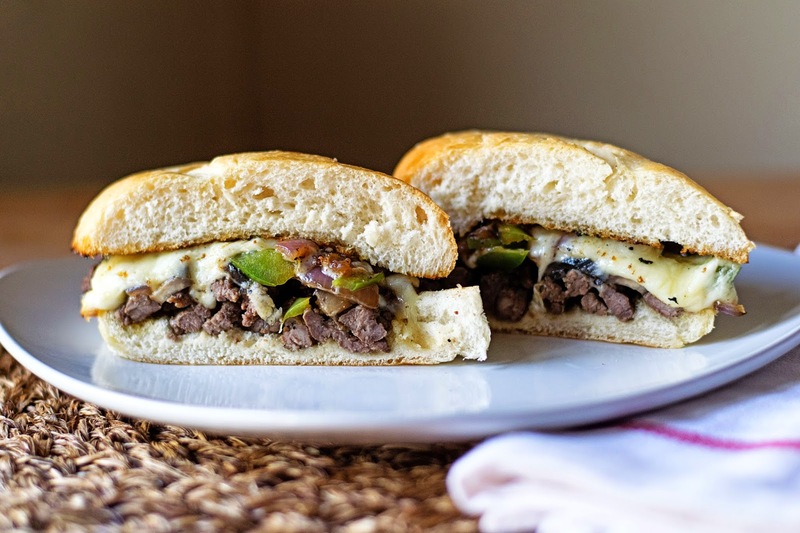 So get in the kitchen and make these scrumptious Philly Cheese Steak Sandwiches tonight! You will be so happy you did. Now pardon me while I go in for a little bite myself! Place the steak on the bread. Then add the pepper, onions, and mushrooms. Finally top it with the cheese.